As we're all getting ready for Mists, the question circles around "Who's making a gear list for <insert class>?" I decided to post my own pre-raid gear list by slot that I wrote up for personal use and maybe it'll help give some of you an idea of where you want to start! Quick note: Most of the rep gear is listed first. This is because the ilevel of the available rep gear is 489, and therefore has more stats allocated to it. Heroic gear from dungeons comes in a close second. Don't stress out if you can't get all the rep gear right away; there are great heroic dungeon options! 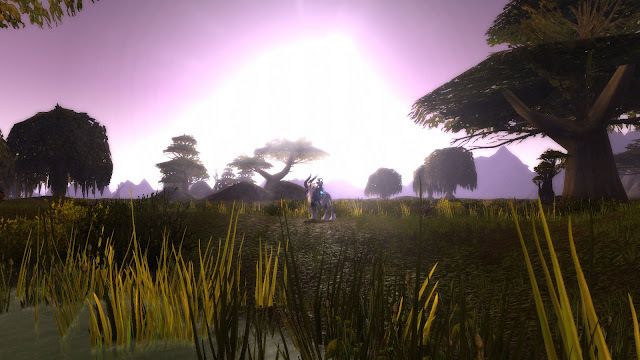 Mists of Pandaria is only a few days away and there's plenty of information out there. In the interest of having something easy to read, I've compiled a list by location of various reputations and dungeon bosses that have the gear that Guardian or Feral Druids may be interested in. 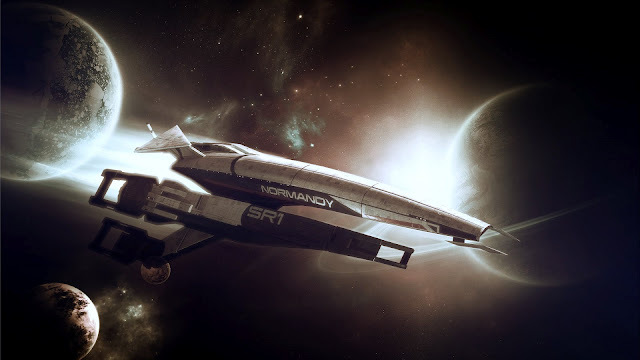 ...with the new patch, and all the new things coming, what are three things that you will absolutely not leave behind? Consider these three objects your virtual backpack- the twist is, a tiny story to go along with each item. My priest, has many sentimental memories associated with her, but not really a big amount of items I would save. I rifled through her bags to see which items I would never be able to delete, and came up with three things - though one is a "set". I remember picking this up and thinking I would farm Argent Dawn rep at the time. 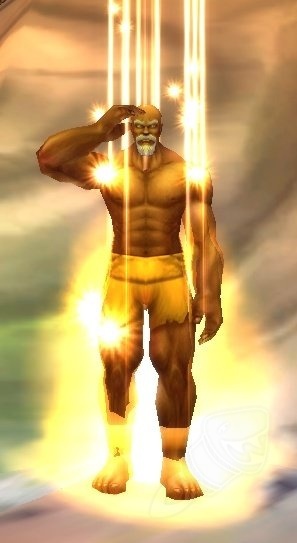 I was hooked on this trinket because it used to make your character salute and a light effect would surround you (kind of what the leveling "ding" animation is). There's no way I'm getting rid of this now, as the trinket is no longer available in game. I like to have things that no one else does! My first full tier set on my priest was T6. I raided in T4 and T5 but the Frozen Shadowweave Set was far too good to replace until T6 (and even then, the Shadowweave chest was still better than the T6 chest). My dagger is still enchanted with Frost and Shadow Damage, my cloak still has 2% Reduced Threat and all the gear has the original gems and enchants. I have great memories about T6 and the Burning Crusade, so my T6 will always have a place in my bank - no matter how many spaces I seem to keep filling! I love this pink shirt, and I love that it gives your character a "Best in Show" buff! I remember looking at Precious when we were in ICC and thinking that it was adorable that she had a ribbon on her neck! Obviously someone really cared about that pooch. When I won that shirt I wore it around everywhere and it's my default shirt when it doesn't clash too horribly with my outfit. Since I've had my druid as long as my priest, I decided to check what items she had that I placed value on. Ah, yes. I love this trinket, and I really thought the questline was neat up until it just kind of... stopped. I did this quest on my priest first and lost her trinket but decided to keep it on my druid. I remember when I first used the trinket and Eranikus was quite angry. I'd never seen anything like this before, and I still feel sad for Eranikus being trapped wherever he is. This particular version of the Essence is no longer available in game, but I plan on keeping this trinket forever. That green stuff is the Essence of Eranikus, I swear! Once upon a time, druids had to complete a long (awesome) quest chain in order to get their final flight form. This key used to be part of the chain where you had to go summon Anzu, the Raven Lord and defeat him to move on with the chain. Afterwards, you got to keep the Moonstone and go back to Sethekk Halls whenever you wanted to farm the mount Aznu drops. I had a group of people who I used to bring my key for so that we could farm the mount. Now that you no longer need a druid there's no reason to keep this key, but there's no way I can get rid of it. My very favourite weapon. I farmed Cenarion Expedition rep so hard to be able to have one of the best tanking maces ever. I collected spears, unidentified plant parts and ran Underbog so much I'm sure I went crazy. It was sold by Fedryen Swiftspear for 265g, which at the time for me was not a trivial amount. I tanked with this mace for a long time, I never did get a Wildfury Greatstaff... I loved that bear druids got a mace called Earthwarden - it's a very fitting title! I'm saving this mace in the hopes that one day, druids will have a viable tanking mace to use so that I can transmog to Earthwarden. 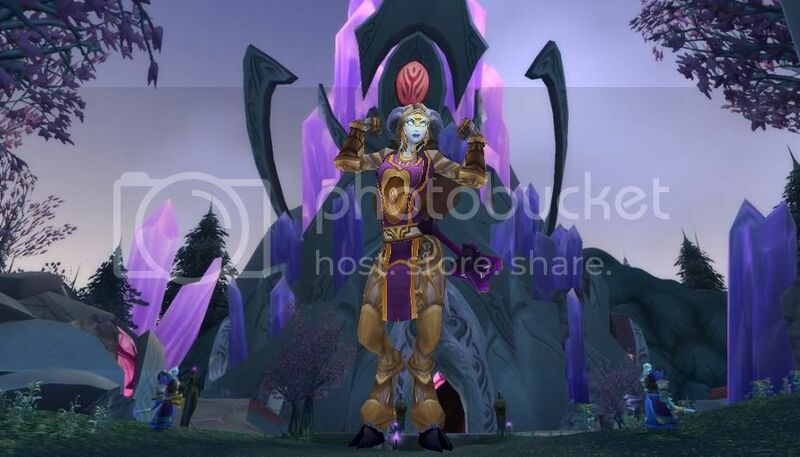 A familiar face to many, the Exodar flagbearer was pictured on WoWInsider just weeks before the competition! All good things must come to an end, and with the event of the summer nearing its closing ceremonies, the athletes of the Exodar will strut their stuff one last time. I had a wonderful time creating all of these outfits, and I'm excited to finally be able to reveal them (without the anonymity). I worked hard to put together some outfits that I thought were great and fit the themes really well - this competition really got the creative part of me working in overdrive. Hats off to JD and the judges for all their hard work! Check the links to see the actual event posts! Cycling, Hammer Throw, Discus, Wrestling, Archery, Javelin, Equestrian, Freestyle, and Fencing. When I think of ladies in a biker gang, I think leather, goggles, and studded shoulders. I tried to go with a red and black theme to keep with matching the Horde version of the Chopper. I also included two Bloody Brass Knuckles because this lady means business. 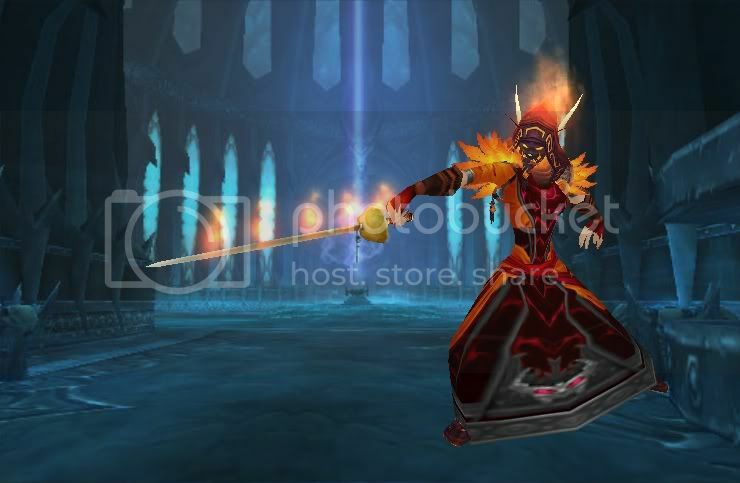 Check out her gear set here! I agonized over this set. I couldn't decide if I wanted to go with more purple or if I wanted the mace to stand on its own. In the end I went with a grey/purple scheme and I really like the way it turned out. I think if I had to do it over I'd pick a more purple-y set of boots. Restricted to Paladins: Shoulders are Heroic tier. I was a little disappointed with the posted results for this outfit. The gold winner looks remarkably similar to this set! In the end, this set didn't place at all and I can't help but wonder if the judges don't like all the dwarf skin. I found this great belt and lo and behold there were matching bracers! Since we weren't going the traditional Olympic style I thought this was perfect. 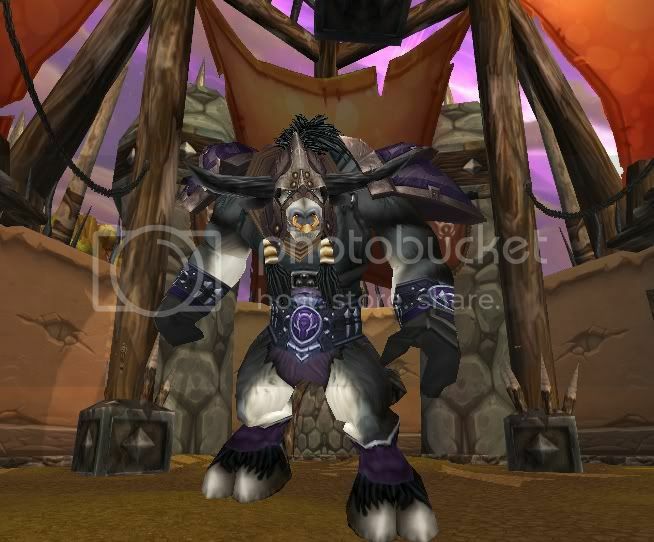 This Tauren is ready to ruuuuummmmmble! Check out his gear set here! I love this bow, and this set looks incredible with a Stormwind Tabard. 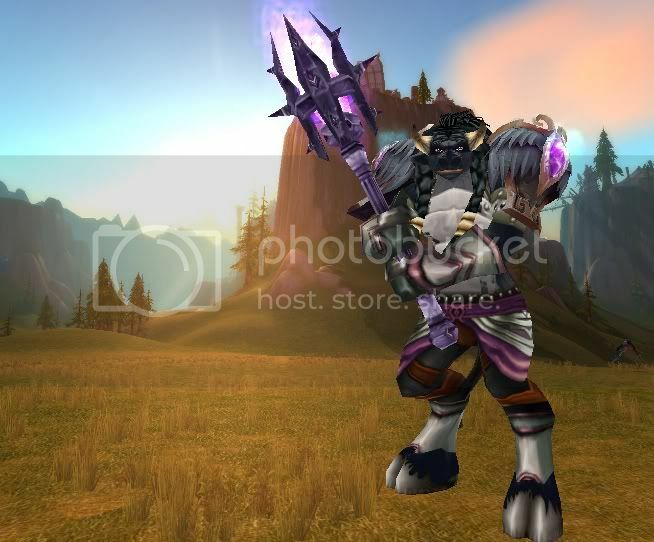 Unfortunately, I was unable to use another faction's tabard but if you wish to recreate this set I recommend it. I really like this set. The replica Beastmaster gear worked perfectly with this great polearm. I came super close to the podium on this event at 382 compared to the winner's 387! Check out her gear here! I chose to match an outfit to the Baradin Wardens Spectral Horse. I'm pleased with the icy blue look I achieved and I think it matches that horse really well. 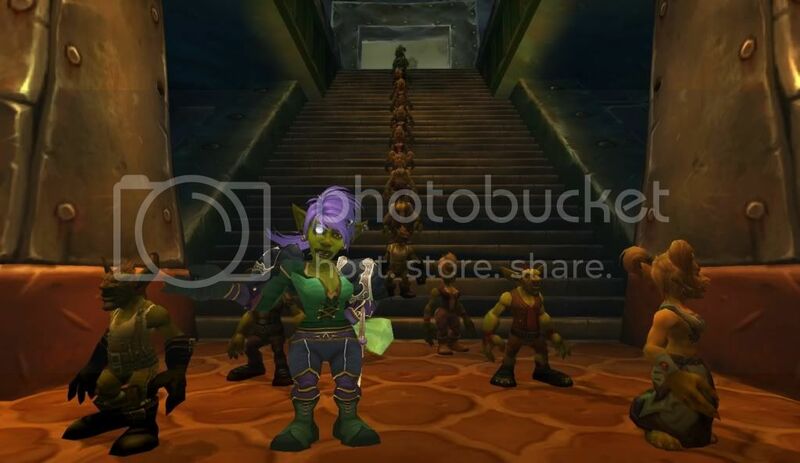 My freestyle outfit ended up being a creation of a new goblin banker. I wanted to use the shoulders so badly, and it works with the rich colours of green and purple. This lady is trying to explain to these people that time is money, and they're wasting hers. The final entrant in this years Transmogolympics! I chose a fiery sword, and matched elements in her outfit to the fire theme. In the end, none of my sets gained any medals but my Javelin set came the closest. I'm a little disappointed, and I have some disagreements (for sets that weren't even mine!). 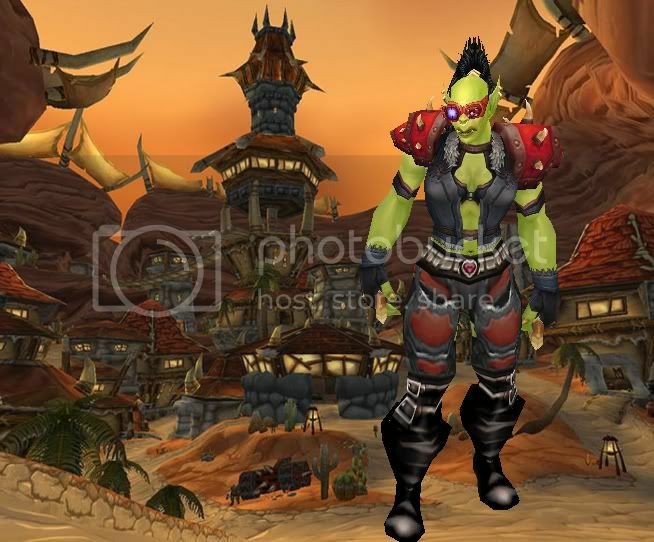 Overall this was an excellent transmog event to participate in and I had an absolute blast creating everything. I really enjoyed participating in this, and I hope that I can find some more Transmog events to try my luck at. It's hard enough competing in an event such as the Transmogolympics, but it's another thing entirely to organize and judge the entrants. Thanks again to JD at Amateur Azerothian, Tome at Tome of the Ancient, Matty at Sugar & Blood and Khizzara at Blog of the Treant. Preparing for an expansion is no small task. There are mats to farm for leveling professions or making gold, there's massive amounts of guild organization and there are decisions to be made about characters and roles you want to play. If you read Kurn's Corner, you'll know that there are steps to take when preparing a guild for a new expansion, and having guild members decide what role they'd like to play in the future is one of those steps. I had to decide; healing priest or bear tank? Ultimately, I chose to play my bear in the upcoming expansion. I've been having a bit of an identity crisis with my priest lately, and the more I play on my druid, the more I enjoy the game. I love my priest, I even wrote a post about how much I love her, but we've had a disconnect somewhere down the line. I am a good healer. Hell, I'd venture to say that I am a great healer but it just doesn't feel right and it doesn't feel like a challenge. I think that part of the reason for this is the race change of Kaleri from draenei to human back before Firelands, and the other part are the nerfs in Dragon Soul. She's still my priest, but she's not Kal. 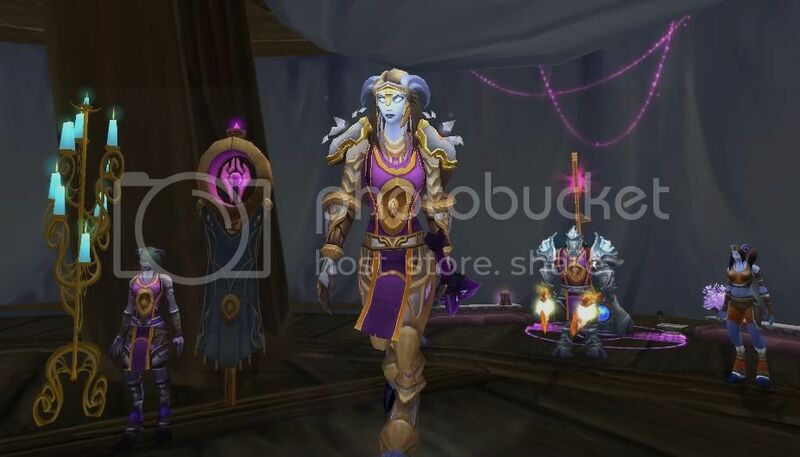 This fierce little human with a penchant for PVP and Hardmode bosses isn't the draenei I rolled back on Bronzebeard, clumsily fighting through Karazhan, applying to guilds through the mail system, and tailoring her own clothes. Taila (or Kalbeari, now) has been a steady rock since Karazhan. She's mangled and swiped her way to victory over Malchezzar, Kael'Thas and Vashj. She held the lines while Illidan was vanquished, used the Tears of the Goddess to thwart Archimonde and stood in awe of the Sunwell. Together we've been the shield for the healers and the damage dealers through many battles, and that will be our role in Pandaria. I leveled Kalbeari to 90 on the beta, and started goofing around in heroics with my friend Sara, a healing priest. Watching Cascade bounce around, or seeing Spirit Shell makes me a little regretful, but as soon as I hit that Incarnation button and become SUPERBEAR, those feelings go away. I watch the boss previews from MMO-Champion and I think, "I get to tank those. My raid will need me to be at the top of my game to survive and take the hits.". It's exciting and scary but I know it will be the challenge I need. Does the class make the person? My priest was my safe haven for some time. I created her just before University began, and played her while my struggle with Crohn's Disease was at it's height. I accomplished a lot with her, and many memories are recorded in her achievements and Feats of Strength. 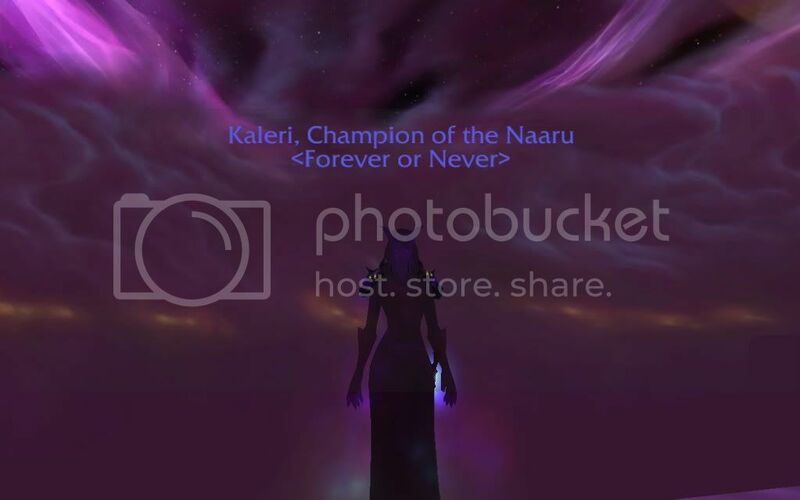 I was Kaleri. My druid was created before my priest but the guild I had joined needed a priest healer (I was later asked not to heal, but to instead play as shadow). Kalbeari was always there when I needed a break from priesting, and I always thought of those two characters as friends of a sort. 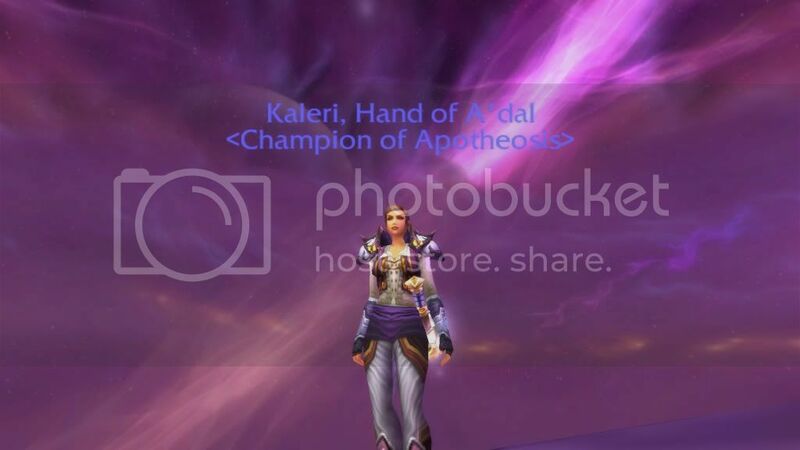 When I play Kaleri, I am a healer. I support my teammates, I take care of them and they keep Horde and enemies away from me. It's not my fault if someone dies to a loose add, but it is my prerogative to heal the tanks, so they can catch those adds. Healing can be a thankless job, especially when you do it so well no one will know what you had to do to pull it off. Take Heroic Spine as an example. My job is to heal the tanks and watch the dispels. 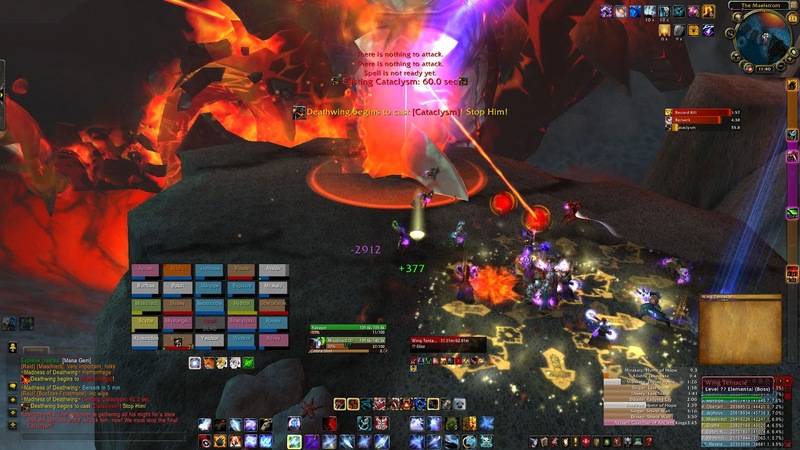 It's not a particularly hard job to dispel, but if you screw it up the entire raid knows it was your fault. However, if you do it perfectly the raid never has to know that there is a dispel mechanic and you take away that problem for everyone. You rarely get thanks, but there's a certain satisfaction when you can do it that well. But when I play Kalbeari, I change a little. I have to be a little harder, take more control and be ready to help the raid as I can. Meaning anything from tanking more adds if someone goes down, using cooldowns like FR to the raid's benefit, to battle-rezzing someone or doing as much DPS as possible while I'm tanking. There is so much a bear tank can do right now to help out, it's insane. Will a new role change me? I think it will, a little. I feel like I've changed and grown as a person since I first created my characters. I've always been in awe of excellent tanks, and it never ceases to amaze me how a good tank can make or break a dungeon or raid run. I will have to take charge more than I do now, and speak up with more authority if I have to call something tank-related. I'm afraid that I will feel a little helpless at times, not being able to heal but my priorities will shift from watching the raids HP to keeping an eye on my own. I used to get really antsy watching other healers while tanking but I've started to learn to let it go. 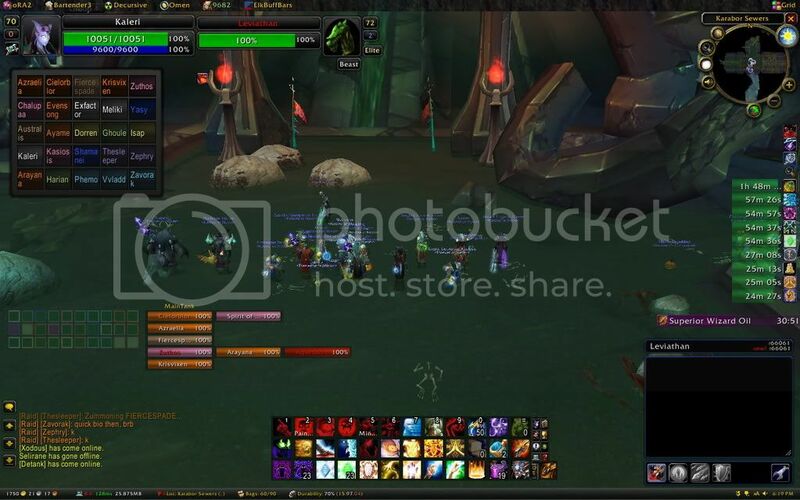 How can I be a good tank when I die because I'm too busy watching the raid frames and I miss my cooldown? That can't happen and I'll have to place my trust in the healers, just like our current tanks trust me. WoW needs more tanks, in particular it needs more tanks who are women. I'm proud to have the ability to switch to my druid and fill those roles. Mists of Pandaria is approaching and it's nearly time for Kaleri to take a break from fighting monsters and the Horde, and fish by the gates of Stormwind for a time. The world has changed, and so have we. I've thrown my hat into the ring for the Transmogolympics! The idea stems from JD at Amateur Azerothian because with the Summer Olympics around the corner, what better way to pay homage than to host a competition of our own? With all that in mind, the very first (and only) outfit I can reveal is my faction's Flagbearer. Each entrant was randomly given a faction, and I drew The Exodar! Fitting for me, since my main (before the race change) and most of my characters have been from the Exodar, I am excited to represent them. 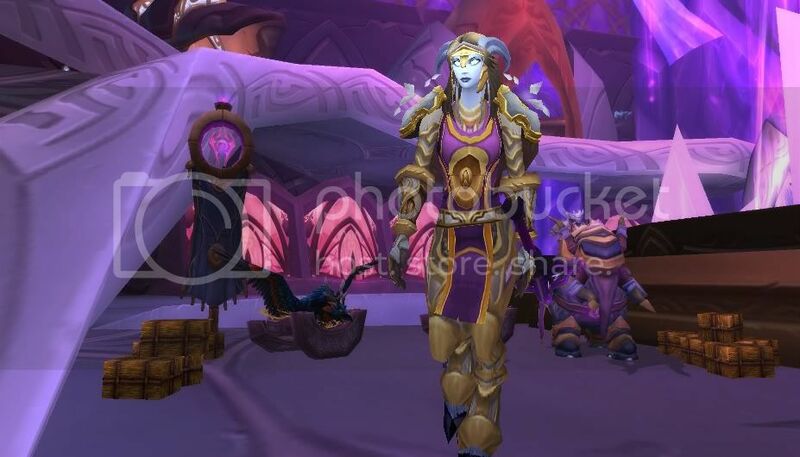 When I picture Draenei in the Exodar, I think rich purples and golds, and of the strong connection to the light that the Draenei paladins have. I went to the Exodar to get a little inspiration, and Velen's guards gave me some ideas. I also traveled up to the Argent Tournament to find out how the Exodar represented itself in the past. At home, in the Exodar. I ended up going with some very recognizable paladin gear, but I wanted to mix and match the sets, so there's some t4, t5 lookalike, and t13 in this set. The shield (not visible in this image, but see the final image in this post) is the one that Velen's guards carry. The tabard is part of the requirements for the Flagbearers, so I chose to make that the stand out, since she's representing her city. Checking out the Argent Tournament. I hope everyone enjoys the sets that we'll be putting together, I can't wait to see what we've all come up with. Good luck to the other participants! 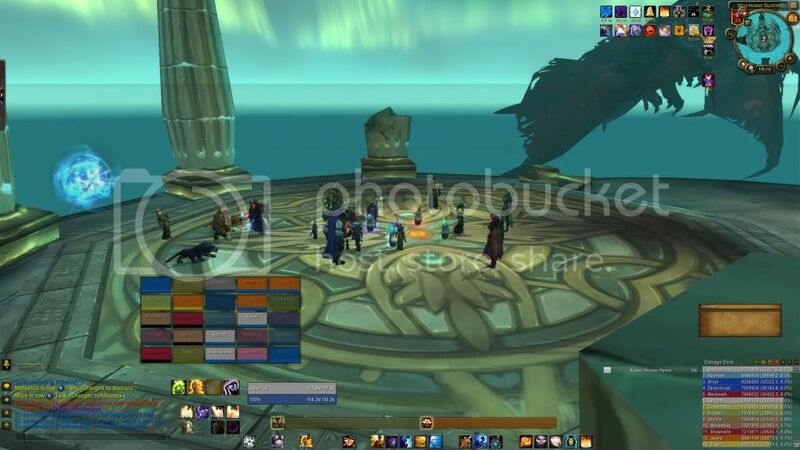 There were quite a few posts circulating a while back on WoW couples and how to 'deal' with them. I had mixed feelings because I am part of a WoW couple - I met my boyfriend through this game and we have almost always raided together. Some of these posts were negative in tone, while others were positive and even discussed the types of people you might see. Matticus wrote a post about WoW couples called "Handling Raiding Couples" which came across as extremely negative. I get that perspective and I'd like to note quickly that it isn't just dating or married couples who are overprotective either. Pairs of friends will do this as well. But I was disappointed in the tone of the article at the beginning. There are mostly negative references to couples (I would hate to be referred to as a vulture) and a quick mention of 'mellow couples' in his guild at the time. I was angry, and then a new series came out on another blog. Sheep the Diamond wrote a five (FIVE) part series on "Couples and WoW"
Part 5 "Surprise Feedback Follow-up"
I really enjoyed this series. I thought it came across as informative and welcomed discussion from many folks in the comments. Stubborn talks about different animal pairings and how you might be able to apply them to couples in your guild. Penguins are really easy to deal with. Penguins by nature don’t mind being separated in their tasks, so the best way to approach penguins is honestly and directly. If you’ve only got one spot, just tell them that; don’t come up with excuses or stories to alleviate your guilt; they don’t mind parting for a few hours. 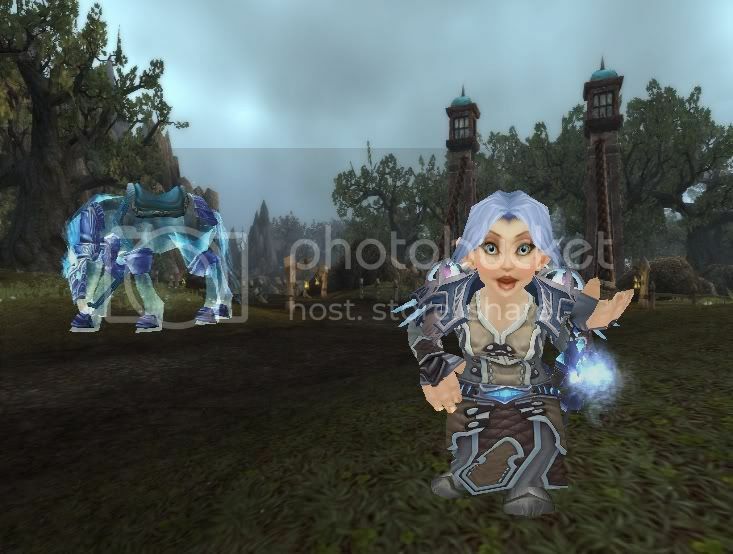 Then I found a post on the official WoW forums titled "Catering to Couples and Groups". Which is basically from someone who has had a hard time with couples or package deals and needed advice. Some people say that you have to treat everyone as a separate entity and others simply say that it isn't worth it. This post "My perspective" by Askevar over on You Yank It, You Tank It is a good read and sounds very similar to my own experiences in WoW while playing as part of a pair. All of these posts got me thinking; Am I part of that stereotypical feared/hated WoW raiding couple? Do I defend my partner if someone critiques him? Does he do the same for me? Welcome to the final transmogrification installment this week. Today's sets are sets that came about because someone had a tough time matching a specific item they really liked to a set they could like just as much. I asked on Twitter the other day if there were items that folks were having trouble matching into their transmogs. I got a few bites, and decided to make up a few sets. To see the items on WoWHead, click on Item List or links provided beside each set. Welcome to the fourth of five transmogrification installments this week. Today's sets are compilations of plate items. 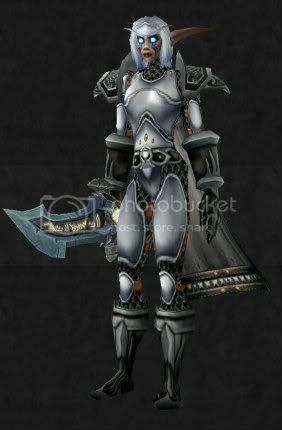 I had a little trouble creating a pally set that I liked enough, so I asked my friend Serrinne for some help and she offered her paladin's outfit. As always, to see the items on WoWHead, click on Item List beside each set. Welcome to the third of five transmogrification installments this week. Today's assortment of sets are compilations of mail items. My two mail wearing classes are hunter and shaman, so I put together some sets that I think represent each of them. Welcome to the second of five transmogrification installments this week. 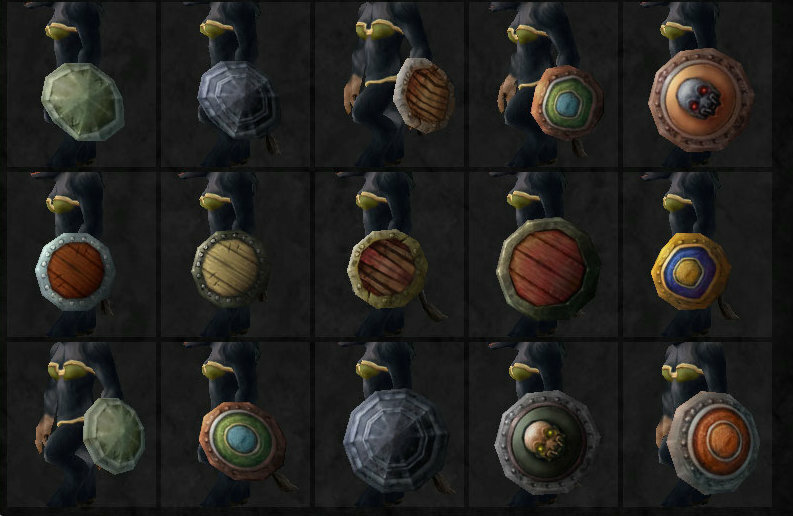 Last time we looked at an assortment of cloth sets, today we'll be looking at various leather outfits. Exactly like yesterday, to see the items on WoWHead, click on Item List beside each set. Welcome to the first of five transmogrification installments this week. Think of it as Power Word: What? 's Fashion Week (or the week after which Kal completed exams and is now bored to tears). 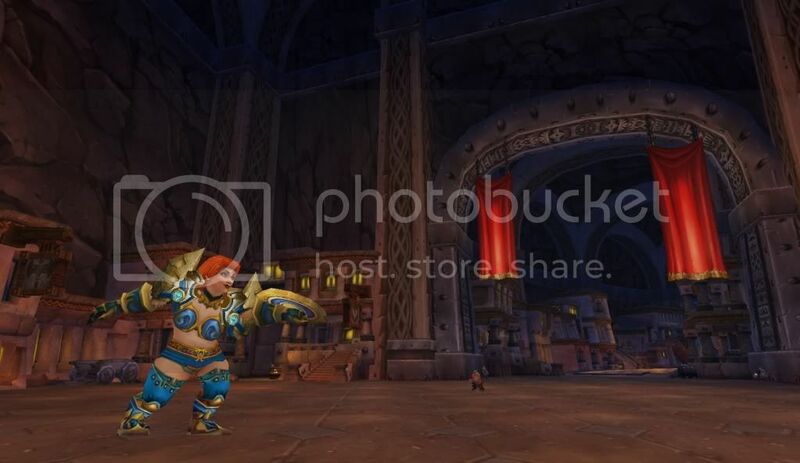 Essentially, each post this week will showcase different armour classes and various transmog sets that I've designed, with some advice from my editor, Serrinne. 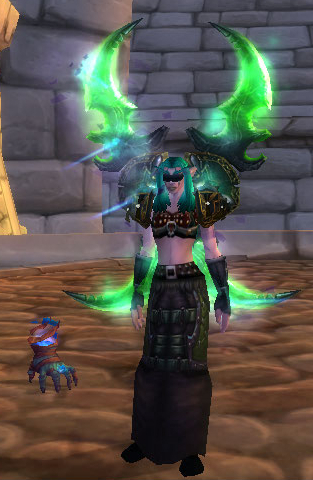 First up, we'll be looking at an assortment of cloth transmog sets that I've put together. To see the items on WoWHead, click on Item List beside each set. Here's something you might not have known about the World of Warcraft; the zones are pretty similar to real world environments. Or maybe you did know it, but didn't know that there was actually some scientific/geographic explanations for it. I don't mean similar just in looks, I mean they are similar in ways that make me think they must have a Geography major working with them. It is something I noticed while playing through Swamp of Sorrows a few years ago and again while I was participating in the Pilgrim's Bounty achievements on my druid this year. I'm on my way towards earning a Bachelor's degree in Environmental Studies - specifically Geography, and in the fall term I took a course titled "Wetlands". It's one of the required 4th year courses and it was a large step up from other courses I'd previously taken. This course teaches the basics AND the advanced knowledge of wetlands and their inner workings, so it is a lot to absorb in four months. What I'm going to try to do is give you a crash course on things I learned that translated into seeing WoW environments in a more appreciative light.